November ushers in the season of coziness and home entertaining. Everyone is making sure their homes are party-ready, and that also includes stocking up on what to wear when guests are on the way. Our editorial takes a creative look at what fashion is this time of year when festivities are in high gear and the stylish opportunities are abundant. Parties at home can vary and the following pages explore trends just as if our fantasy hostess were out on the town dressing in a cornucopia of chic ensembles. We’ve whipped up a few good looks with the help of local retailers who are keeping all of these great items in stock right here in Memphis. So there’s no excuse – having style is always in good taste. Susan and Jim Walker for hosting us in their home. Simple classics rule, and sometimes the easiest is also the most stylish. White Oxford button down blouse and washed silk trousers; both from Sorelle Boutique. Earrings and bracelets from James Gattas Jewelers. Chef David Krog is a pro as our hostess learns from his kitchen precision-all while wearing a fantastic outfit, of course. Earrings from Sorelle Boutique. Shoes from The Pink Door. Dress from Oak Hall. 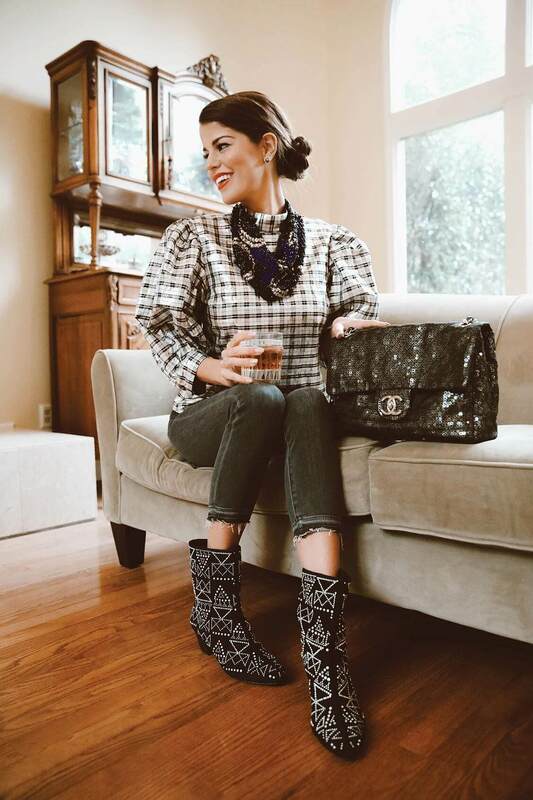 Be a cozy but couture-loving guest with pieces that radiate fashion confidence. Top and purse from Joseph; slim cut jeans from Lori James; both in Laurelwood. Collar from Oak Hall. Earrings from James Gattas Jewelers. By now, the sneakers trend has made its mark.Glam kicks add comfort and really are pretty fantastic. Wearing them at a house party makes perfect sense, especially when paired with a glittery top and well-fitted pants. Earrings from James Gattas Jewelers. Top and pants from Betty Hays Boutique. Cork it in style with this soft and pretty timeless dress amped up with on-trend rose gold rocker sandals. Dress and earrings from The Pink Door. Necklace from Betty Hays Boutique. If you’re going to sit on the bar, you may as well look like you own the place. Being fancy is easy with this knock-out cocktail dress and stunning jewelry. Nobody will tell you to get off the bar if you’re looking this good. Bracelet and ring, both by Saundra Messinger. All jewelry and dress from Kittie Kyle.